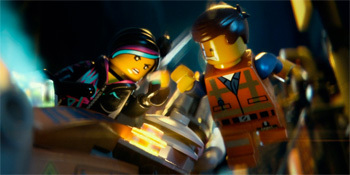 With all the films based on previously established intellectual property that have already hit the big screen and are still on the way, it's easy to be skeptical of a film that doesn't seem to be trying too hard by simply being called The LEGO Movie. After all, how can you craft a story around the building block toy and the countless, seemingly unrelated worlds that have been turned into various LEGO sets? Thankfully, directors Phil Lord & Chris Miller (Cloudy with a Chance of Meatballs, 21 Jump Street) have crafted an answer that's original and keeps the spirit of imagination alive at a time when Hollywood seems out of creativity. Our story follows the energetic but not too bright construction worker Emmet (Chris Pratt), who despite not having anyone to share his happiness with, keeps his spirits up. "Everything is Awesome" isn't just the popular song on the radio that everyone in the LEGO city knows by heart, but it also seems to be the motto of this building block world. From the very beginning, the way Lord & Miller have used the LEGO brand to bring this world to life is amusing and mesmerizing. The animation is jittery, so as to feel like stop-motion animation created with real LEGO pieces, and it adds a certain level of authenticity and charm. Anyway, this awesome world all seems to be in working order thanks to President Business (Will Ferrell), until Emmet stumbles upon a relic called "The Piece of Resistance," which puts him in the leader's crosshairs. Why? Because it's the only thing that can stop Business from using a weapon called "The Kragle" to make things the way they're supposed to be. And so, Emmet finds himself thrust into an adventure that takes him across new and strange LEGO worlds, with master builders (quick-minded minifigures who can build something from anything) like Wyldstyle (Elizabeth Banks) and Vitruvius (Morgan Freeman) guiding him as he tries to fulfill a prophecy said to save their world. Though the plot sounds simple and formulaic, it's the actual details (including the reveal of the "Kragle" and possibilities within the world itself) that make this story more than charming. Each setting, vehicle and character feels like it's fresh from the imagination of the kids who find endless possibilities in a pile of LEGO bricks. But what makes the story truly unique is Lord & Miller's meta sensibilities to reference the real world outside of these LEGO characters. The inclusion of certain set pieces and plot devices might raise eyebrows for adults (though the film is far too fast and fun for it to be truly bothersome), but without spoiling one of the most creative parts, everything makes sense when the scope of the story is revealed. Aside from the sterling animation and amazing fantastical creations, all made with reference to real LEGO pieces and figures, the voice cast deserves plenty of praise as well. Chris Pratt's upbeat and childish nature, even in the face of danger, is hilarious and delightful. And while Morgan Freeman at first seems relegated to a role that seems predictable, the way Lord & Miller have written all the characters allows his trademark voice to deliver some very funny and unexpected one liners. Plus, there's all the fun supporting characters like Batman (voiced and presented in perfect parody by Will Arnett), a Good Cop/Bad Cop (Liam Neeson having a blast), an enthusiastic 1980s spaceman (Charlie Day), a Frankenstein-esque pirate-robot creation called Metal Beard (Nick Offerman), the happy-go-lucky Unikitty (Alison Brie) and plenty of other surprising characters. This movie is never boring, immediately inciting smiles and joy that lasts throughout the whole film. There's infinite cleverness abound from the self-referencing fact that this is a movie to the very nature of the story which is groundbreaking, heartfelt and full of pure adventure that will satisfy adults and children alike. It never panders or feels artificial, as many other adaptations of toys try to create a faux sense of nostalgia. 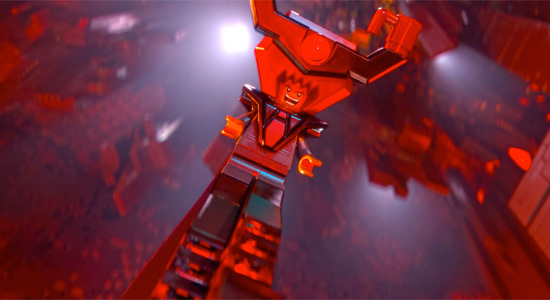 The LEGO Movie is a film made by big kids who know how to tell a story based on a toy without losing the spark of imagination and originality that makes that toy special. Phil Lord & Chris Miller (and plenty of incredibly talented animators) have crafted an amazing piece of entertainment that is much more than the simple title implies and sets the bar high for future toy-based films to reach. 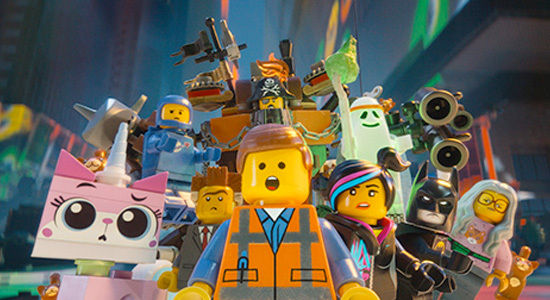 The LEGO Movie will touch your heart, blow your mind and have you laughing heartily. You won't regret giving this movie a chance to tickle your imagination and make you feel like a kid again. Wow, this sounds so dope. im all in... Too bad girls hate Legos. I work at a school and the little girls cant stand how much boys love legos. My daughters love Legos. They have all the girlie pink ones now, but they like the others as well. Saw the movie last night, loved it. There were no kids last night at the theater I work at for our 10:00 showing(even with a snow day yesterday and today), it was all adults. Every bit as good as the last 5 Pixar films, and waaaay funnier. It's a unique, hilarious, and just superb animated film. Absolutely 10 out of 10. I highly agree. The ending just sold it for me. Fantastic movie all around. Sounds as awesome as the trailers' look. Can't wait for Valentines Day..?! Hah.